Acknowledged author Joseph A. DeVito wrote Human Communication: The Basic Course comprising 496 pages back in 2017. Textbook and etextbook are published under ISBN 0134407083 and 9780134407081. 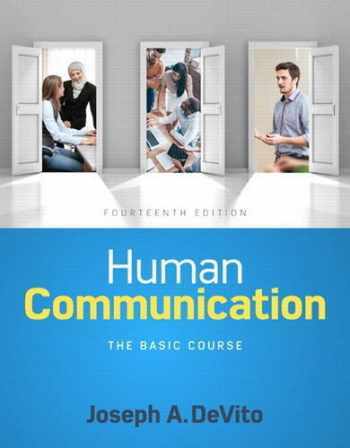 Since then Human Communication: The Basic Course textbook received total rating of 4 stars and was available to sell back to BooksRun online for the top buyback price of $69.24 or rent at the marketplace. For courses in Introduction to Communication A comprehensive overview of the theory, research, and skills of communication Human Communication: The Basic Course provides an in-depth look at the fundamental concepts and principles of human communication. Writing for students with little prior background in the discipline, author Joseph DeVito provides the significant foundation needed for more specialized study of interpersonal, small group, and organizational communication, as well as public speaking. The Fourteenth Edition fully integrates the latest research as well as new examples, exercises, and photos to keep the text current and pedagogically effective. Human Communication: The Basic Course, Fourteenth Edition is also available via Revel™, an interactive learning environment that enables students to read, practice, and study in one continuous experience.